UFIT introduces new Commercial Director Will Skinner to the UFIT Team. UFIT is delighted to announce the appointment of Will Skinner as its Commercial Director. 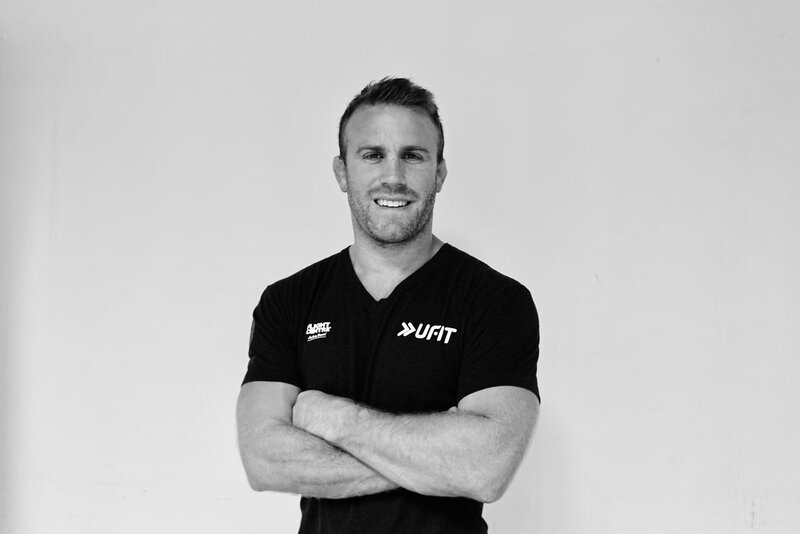 Will is responsible for over-seeing all of UFIT’s commercial and brand development activities, with the aim of enhancing the overall wellness experience for existing clients, and developing relationships with new clients and partners. James Forrester, UFIT’s Founder and General Manager announced “We have thousands of clients who now do fitness training and nutrition programs with us, and as we continue to grow we want to make their experience even more rewarding, and easily accessible. We can do that by affiliating with other great lifestyle-focussed businesses to offer clients a complete, holistic service, and developing attractive packages for companies wanting to improve the well-being of their staff. Will is a former English Rugby Premiership captain and brings great experience to UFIT." Will has been involved in professional rugby for over 14 years with England, Leicester Tigers and Harlequins, both as a player and on the commercial side as Head of Sales and Business Development. Will concludes “I’m really proud to join James and his amazing team. After a number of years playing against James on the rugby field and then watching his success with UFIT from afar, when the opportunity came up to become part of the community I just couldn’t say no. The culture of UFIT and its members is incredible and I can’t wait to build on this and realise UFIT'S potential across Singapore and SE Asia”. Will joins the UFIT management team, and will work with UFIT’s Marketing Manager Lizzie Wright. Have you ever wanted to know what it's like to experience the UFIT Clean & Lean Challenge? Kelly Latimer joined us for her first taste of the programme last year and documented her first week of whilst busy travelling. If Kelly can fit it into her schedule then you definitely can. Hear more from Kelly about the first week and the changes she started to experience. Spent this week in Thailand on shoot for a new show. I’ll be spending 3 weeks of this challenge out of Singapore and away from physical support and meal prepping abilities. Been watching everyone’s posts in the Facebook group, feeling a little sad that I can’t cook. Production shoots leave little room for choosing food during the day, but I made sure before I left that I brought along almonds, oats and whatever easy snacks that didn’t look like they contained too much sugar. Fruits have been the main reach-for items, because that’s what the local crew provides. Evenings have been easier. Veg heavy meals with good fresh protein, lots of fresh fish. I’ve managed to limit processed food consumption to a minimum and I do feel plenty better for that. Although right now all I want is a pizza! Heading home this weekend and really looking forward to eating well in the coming week. First day of the challenge and I’m in Malaysia on shoot. I’d be lying if I said I’ve eaten clean all day today. Curry for lunch at a restaurant. Dove into the veggie curry, but I’d needed to supplement with some rice. Long shoot days become longer with no carbs. I hope this is all in the mind. Home. Scrambled eggs for breakfast to start the day right. Wanted to make egg muffins, but was so tired I couldn’t make it out of the house to go grocery shopping. I’ll have to work on that. Much of the day spent recuperating from my week of shoot. Dinner for Mother’s Day was decent. Chinese food is actually pretty good for eating clean. Roast meats, plenty of vegetables and good soup. Back on the road. Thailand-bound. Does anyone realises how hard it is to find good clean food at the airport?! Skipped on the aeroplane food because it was 80% carbs. There was a little salad that came with it. Devoured that. Avoiding too many raw food dishes, so no papaya salad for me at dinner. Meats and veg all good so far. Breakfast will be sent to your room at 5am, they said. Half a slice of toast, a fried egg and 4 slices of some overly processed ham. I skipped on that. Had oats that I brought instead. First day of shoot. Looking at a 15 hour day. Couldn’t survive without some rice today. Options are limited. Apples and bananas for snacks. Another long day ahead. More gross breakfasts. They’re trying their best, but the concept of “carb free” and “clean” where I am is a foreign concept. Dinners are OK when I can order what I want, but the lunches have been terrible. Noodles today. Yummy. But definitely not C&L approved. Need food though. Feeling very sluggish. Two short days, but even earlier call times. I don’t drink coffee any more, so I’m really finding it hard. I’m just so tired. Filming under shelter today, so it’s not as hot. Water is my best friend - when we’re shooting in a place with a good toilet. Managed to hit the gym proper today. Other days were just short workouts in the room. Felt so strong, but then afterwards… SO HUNGRY! Last day of shoot. Going home tomorrow. SO EXCITED! I’m aching from yesterday. Definitely need more protein, but I’ve gone off beef. Pork and fish seem ok. I want a pizza. Like. I really want a pizza. Been looking at options for a cauliflower pizza base that I can potentially cook next week. The carb craving is real. Haven’t needed sugar as much as I’d think I would. I’m sure that’ll change and I have been eating fruit. We’ll see what tomorrow brings. Host & Vocal Talent Fitness Enthusiast, friend of UFIT. Best Outdoor Bootcamps in Singapore’, courtesy of the SHAPE Sports Awards 2017. We're SO proud to announce that our SHEFIT classes have been awarded the 'Best Outdoor Bootcamps in Singapore’, courtesy of the SHAPE Sports Awards 2017. We’re delighted they’ve recognised the amazing community spirit that exists amongst us, along with our high standards of coaching and our trainers' unique ability to motivate and encourage you all. It's been an amazing journey since we began with our awesome Founder Lisa Clayton who built UFIT Bootcamps to what it is today. Her energy and passion is contagious amongst our community with our coaches and UFITers. We can't wait to continue 2017 and deliver only the best for you! Wendy Riddell commented “It’s important to us that every single UFIT class you do is rewarding and fun. When we as coaches see you all smiling and glowing and getting fitter and stronger along the way we know we’ve done our job. We are proud of you all and love seeing the friendships you have all developed with each other along the way. All of us at UFIT want to thank you all for your incredible support and we’re excited to continue to work with you to make your bootcamp classes the highlight of your day”. A big thank you for the recognition to be nominated as Shape Magazine Best Outdoor Bootcamps in Singapore’, courtesy of the SHAPE Sports Awards 2017.